A pair of speedsters is looking to get ahead of the pack in the sports cars category in 2019. One of them a sophomore and the other a seasoned veteran, they both have their highs and lows in comparison with the competition. Find out who crosses the finish line first as we square off the 2019 Lexus RC F and the 2019 Chevrolet Corvette. Drivers looking for a powerful driving experience will find the Lexus RC F and the Chevrolet Corvette to be intriguing options. They both offer stylish lines and powerful engines that will produce thrilling performance on the road. A closer comparison of both vehicles will help direct them toward the vehicle that best suits their lifestyle. Taller drivers and those looking for a roomier cabin will appreciate the additional head space and leg room they find in the Lexus FC F over the Chevrolet Corvette. The Chevrolet Corvette has seating for two while the Lexus RC F has seating for four. This will definitely play a significant role in consumer preference. Drivers who need to ferry children to school or clients frequently will be better served by the Lexus RC F rather than the Chevrolet Corvette. On the other hand, the Chevrolet Corvette has a larger cargo capacity. So, while it has less seating, it can carry more luggage and goodies than the Lexus RC F. This is a trade-off drivers will have to make. Is cargo capacity more important or is seating? There are a lot of variations between these two vehicle’s sizes and maneuverability. The body style of the Chevrolet Corvette is decidedly wider than the body of the Lexus RC F by comparison. This means that it will be tougher to maneuver in tight spaces and to find a parking spot that is comfortably large enough. On the other hand, it is also shorter than the Lexus RC F so some drivers may actually find it is easier to pull into and out of parking spaces and garages. Consumers need to test drive to get a feel for their preference. Here the Lexus RC F wins hands down. With 18-20 mpg in town and 24-28 mpg on the open road, the Lexus RC F offers much better fuel economy over the Chevrolet Corvette. The manufacturer states that the Chevrolet Corvette gets 13-16 mpg in the city and 19-25 mpg on the highway. The Chevrolet Corvette has a V8 engine. This gives it a much higher torque than the V6 engine in the Lexus RC F. Ultimately, the Chevrolet Corvette’s engine is more efficient in terms of conveying power directly to the wheels. The more powerful engine in the Chevrolet Corvette means more horsepower, too. While this power translates into an exciting driving experience, consumers also need to understand this is can drive insurance premiums higher, as well. The MSRP for the 2019 Chevrolet Corvette is between $52,099 – $112,679. The 2019 Lexus RC F is at $40,520 – $42,534. There are so many things that factor into the overall cost of car. Even if you start simply at the base price, the Chevrolet Corvette has a heftier price tag than the more economical Lexus RC F. The Lexus RC F also has a better basic warranty (4 years/50,000 miles). The Chevrolet Corvette comes with a basic warranty for 3 years or 36,000 miles. When consumers look at both of these vehicles, they find they both provide superior driving experiences. They are also both well known for performance and handling. While there are differences, some distinctive, other more subtle, it will come down to engine size and the size of cabin’s interior and seating. With these things, it will really come down to consumer preference or need. Regardless of which direction one leans in, both choices are quality vehicles that are destined to be appreciated by consumers. What better way to begin a comparison of two powerful models than with what they have hiding under their respective hoods? Sometimes new is better, but when it comes to power and these two cars, be sure that the old school Corvette still has the punch to leave most of the competition on its rearview mirror. 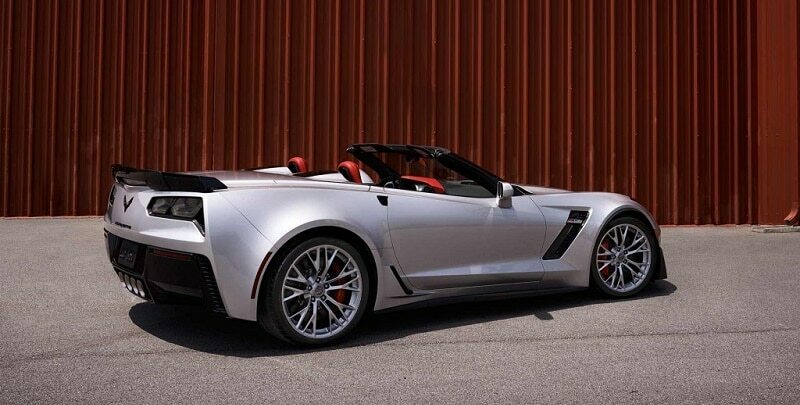 In its 2016 2-Door Z06 Convertible w/3LZ trim, the Chevrolet Corvette has a beast of a 6.2 Liter Gas V8 engine that can make a whopping 650 horsepower and 650 net torque. On the other side of this challenge, the 2016 Lexus RC F has a 5.0 Liter Premium Unleaded V-8 engine, which can provide its driver with 467 horsepower and 389 net torque. While it is a good way behind in the engine power department, the Lexus RC F has an advantage over the Corvette in fuel economy. The RC F’s fuel economy rating is estimated at 16 mpg driving in the city and 25 mpg on the highway. The Corvette, on the other hand, has an estimated fuel economy rating of 15 mpg in the city and 22 mpg on the highway. Lexus buyers will be happy with their fuel consumption, but there is a lack of trims available for the 2016 RC F that might bother some people as the Lexus coupe is available in only one trim. Chevrolet, however, made sure to have a wide span of options available for individuals looking to buy a Corvette. The Chevrolet coupe has a total of 18 different trims available for customers to choose from. Divided in 1LT, 2LT, 3LT, 1LZ, 2LZ, and 3LZ options, the Corvette is available in the following trims: Stingray Coupe, Stingray Convertible, Stingray Coupe Z51, Stingray Convertible Z51, Coupe Z06, and Convertible Z06. Now for the fun part, the features these cars are equipped with. First, neither of these cars would be a joke to play with on the track. The RC F has the power to clock 0 to 60 in 4.4 seconds and reach a top track speed of 168 mph, nothing to joke about. And yet, the Corvette still has the stats that make the RC F’s numbers seem very down to earth as the Stingray can make it from 0 to 60 in 3.7 seconds. Furthermore, the Corvette Z06’s numbers are even more impressive, clocking 0 to 60 in just 2.95 seconds. To go along with its race-car-like specs, the Corvette also displays an array of other features for the driver’s comfort like the Chevrolet MyLink, which “keeps you connected and entertained with a retractable 8-inch diagonal high-definition MyLink† color touch-screen. Using steering wheel controls, hand gesture recognition, and voice recognition capabilities, you can talk, text and stream music without taking your hands off the wheel,” according to Chevrolet.com. As you’d expect from the variety of available trims, the prices for the 2016 Chevrolet Corvette also cover a wide range. Starting with the Corvette 2-Door Stingray Coupe 1LT starting at $55,400 and going all the way up to the Corvette 2-Door Convertible Z06 3LZ starting at $83,400. The 2016 Lexus RC F is available starting at $62,805.